Both the curly leaf form (P. crispum) and the Italian flat-leaf form (P. crispum var. neapolitanum) of this useful herb are members of the carrot family Apiaceae, and share a close botanical relationship to their cousin the parsnip (although the similarity in names is coincidental). 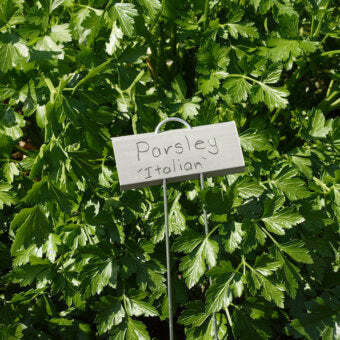 As with most other members of this family, parsley grows feathery, deep-green foliage above a long taproot, and eventually flowers in its second year, sending up a tall umbel of white blooms that set masses of small, oily seeds. A third, less familiar variety of parsley is known as Hamburg parsley (P. crispum var. tuberosum) and is grown for its thick white taproot. Its leaves can also be used, but their flavour is far more intense — to the point of being too much for many palates. The roots, though, are a common ingredient in soup and stew recipes from Eastern Europe. Parsley has a rich cultural history with many references dating from ancient Greece and Rome. Although it seems to be native to the Mediterranean region, there is some confusion about its exact origin. 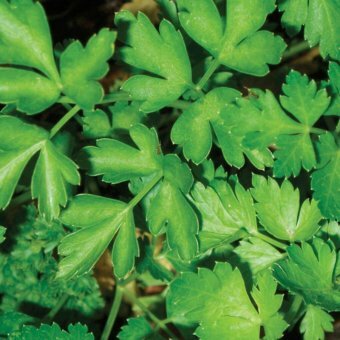 Many different, closely related plants may have been called parsley. The ancient Greeks celebrated their athletes with wreathes of parsley, but the herb was also associated with death and oblivion, so it rarely brought to the dinner table. Parsley was even used to hide the odour of corpses. In the Medieval period, many superstitions surrounded the herb, including the notion that its slow germination was due to the seed traveling to hell and back seven times. Deeply superstitious farmers would not grow it. However, in the Hebrew celebration of Passover, parsley is used as a symbol of spring and rebirth. In recent decades, the main North American use for curly parsley has been as a boring garnish in restaurants, not really meant for eating. But it is a richly flavoured, useful herb that enjoys a more central role in many dishes from southern Europe and the Middle East. It is chopped with garlic and lemon zest to form gremolata, a topping for stews in Italy. In France, it is just mixed with chopped garlic to create persillade, a tangy paste that is makes a beautiful topping for fresh oysters. It’s also an essential element (with thyme, marjoram, and bay) of the herb combination known as Bouquet Garni. Parsley is the main ingredient of Lebanon’s national dish, tabbouleh — mixed with bulgar, tomato, mint, scallions, lemon and olive oil. Delicious. Flat-leaf parsley may be more commonly associated as an ingredient in dishes than beside them. Like lovage, some chopped parsley adds both colour and flavour to soups and sauces, and the herb complements fish and poultry particularly well. Regardless of the type, parsley is very popular as a companion plant. Predatory wasps and other beneficial insects are attracted to its scent and flowers. Where tomato hornworm is a problem (not here in south-coastal BC), it is often inter-planted with tomato rows to attract the wasps that feed on hornworms. This is discussed in greater depth in our article, Companion Planting with Umbelifers. If it is crushed and rubbed on the skin, parsley may help to reduce the itching from mosquito bites. The notion that chewing parsley neutralizes the effect of garlic on one’s breath appears to be a myth. At least, it’s no more effective than chewing anything else. Eaten raw, parsley contains significantly high levels of vitamins K, C, and folate, and it’s a very good source of the minerals potassium, phosphorus, zinc, and iron. When parsley is added to the compost, it carries these minerals with it, enriching future soil. It appears that eating parsley increases the body’s uptake of manganese, which helps to build strong bones. This effect is enhanced if parsley is consumed with shellfish and other foods that are rich in copper and zinc. It is under the dominion of Mercury; is very comfortable to the stomach; helps to provoke urine and women’s courses, to break wind both in the stomach and bowels, and doth a little open the body, but the root much more. It opens obstructions both of liver and spleen, and is therefore accounted one of the five opening roots. Galen commended it against the falling sickness, and to provoke urine mightily; especially if the roots be boiled, and eaten like Parsnips. The seed is effectual to provoke urine and women’s courses, to expel wind, to break the stone, and ease the pains and torments thereof; it is also effectual against the venom of any poisonous creature, and the danger that comes to them that have the lethargy, and is as good against the cough. The distilled water of Parsley is a familiar medicine with nurses to give their children when they are troubled with wind in the stomach or belly which they call the frets; and is also much available to them that are of great years. 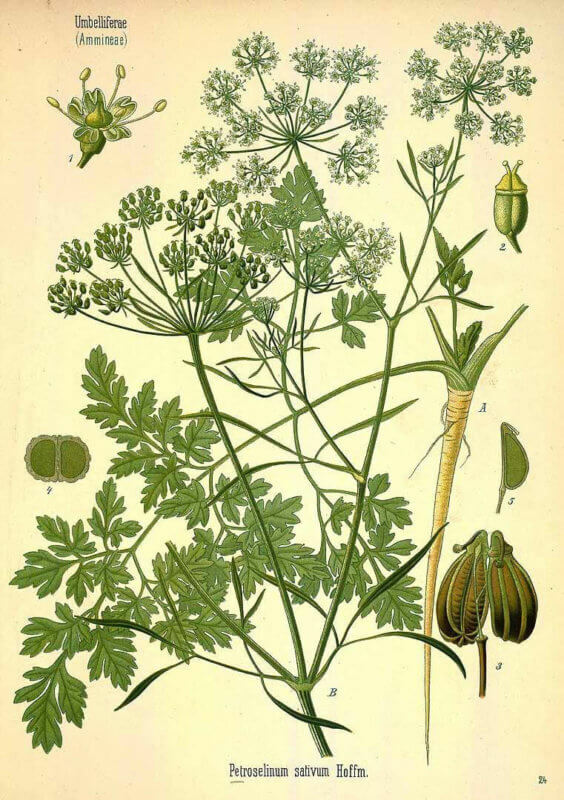 The leaves of Parsley laid to the eyes that are inflamed with heat, or swollen, doth much help them, if it be used with bread or meal; and being fried with butter, and applied to women’s breasts that are hard through the curdling of their milk, it abates the hardness quickly; and also takes away black and blue marks coming of bruises or falls. The juice thereof dropped into the ears with a little wine, eases the pains. Tragus sets down an excellent medicine to help the jaundice and falling sickness, the dropsy, and stone in the kidneys, in this manner: Take of the seed of Parsley, Fennel, Annise and Carraways, of each an ounce; of the roots of Parsley, Burnet, Saxifrage, and Carraways, of each an ounce and an half; let the seeds be bruised, and the roots washed and cut small; let them lie all night to steep in a bottle of white wine, and in the morning be boiled in a close earthen vessel until a third part or more be wasted; which being strained and cleared, take four ounces thereof morning and evening first and last, abstaining from drink after it for three hours. This opens obstructions of the liver and spleen, and expels the dropsy and jaundice by urine. Difficulty: All types are easy and well-suited to growing in deep containers. Timing: Sow indoors in spring (mid-February to mid-March), or outdoors from May onward. Parsley grows well as a winter harvest crop if it is given some protection. Sowing: Soaking overnight may speed up germination, which can take as long as 12-28 days. Be patient. Sow seeds 5mm (¼”) deep. Soil: Rich, well drained soil with ample organic matter in sun or partial shade works best. Growing: Thin to 15-20cm (6-8”) apart, and keep soil relatively moist. To prevent “volunteer” plants, make sure to remove flower stalks before they open. Harvest: One to three plants is usually adequate for the family garden, and sprigs or branches of parsley can be harvested nearly all year round, particularly if grown under a cloche in the winter. Storage: Refrigerate cut parsley either in the crisper or with its stems in a cup of water. Parsley does not maintain its flavour well when dried, although it is particularly good for freeze-drying. Otherwise, freeze chopped leaves in ice cube trays as you would basil. Seed info: In optimum conditions at least 60% of seeds will germinate. Soil temperature for germination: 10-27°C (50-80°F). Usual seed life: 1 year. Growing for seed: Commercial parsley seed producers isolate their varieties by 2km (1 mile). Pests & Disease: Almost trouble free. Parsley attracts beneficial insects.